Located in Oak Bluffs, this restaurant’s signature clam chowder has been rated the best chowder in New England by Yankee Magazine, and the best chowder many years in a row by Cape Cod Life Magazine. You really should try a bowl or cup when you visit. But chowder isn’t all that’s on the menu. Choose from entrees like Grilled Atlantic Salmon, local Pan-Seared Scallops and Lobster Mac and Cheese that’s extra generous with the chunks of lobster meat. 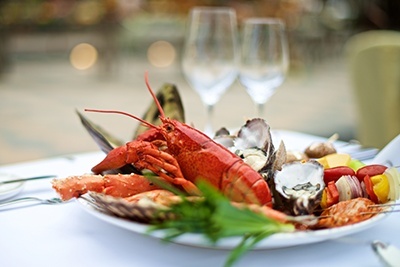 Seafood lovers can get their fill of shellfish—clams, shrimp and more—as well as fresh catches like swordfish and tuna. Dine out in a casual, relaxing atmosphere with plenty of TVs to catch the next Patriots game! This converted 1800s sea captain’s house in Edgartown now boasts the most mouth-watering seafood dishes! When you picture a seafood restaurant on Martha’s Vineyard, this is the kind of place that comes to mind, with rustic, inviting surroundings and lots of lobster and melted butter! You can get lobster any way you like it—baked, stuffed, in a casserole. This restaurant is a favorite of the locals, with a quaint ambience and many other selections on the menu for non-seafood eaters as well. When you’re on the go in Edgartown, this is the place to grab a quick bite. It looks like a miniature New England house, located right on the dock. If you get hungry before catching the ferry, treat yourself to fried fish, fried clams, ice cream and more. And did we mention the lobster burger? This is a cozy spot in Edgartown, offering breakfast, lunch and dinner. Start off with some lobster deviled eggs. Then try their sea scallops or roasted cod. If you stop in for lunch, grab a lobster roll, and the non-seafood eaters in your family can also find plenty of other entrees to choose from. Experience fine dining at this upscale, yet casual, eatery in Edgartown. Specializing in Italian-American fare, The Grill offers dishes like Lobster Turnover with Shrimp and Lemon Cream Sauce. They offer 2-for-1 entrees every Thursday, Friday and Saturday. This is just a sampling of some favorite places to go for seafood. Keep checking our blog for more dining choices on Martha’s Vineyard!